Offline learning is the latest tool for the unorthodox education organization. Here’s how that and other new features will power Khan Academy’s new app. 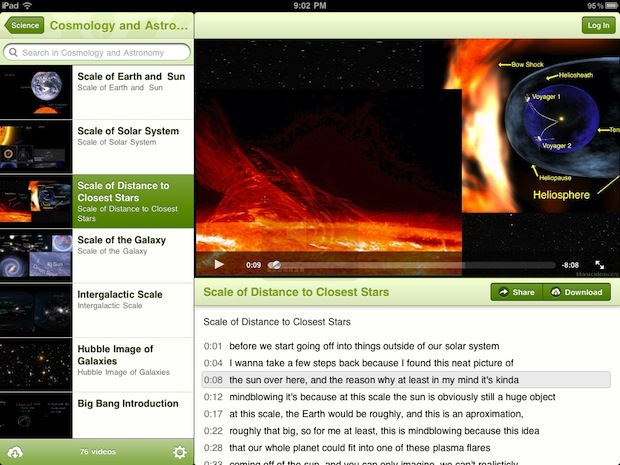 Khan Academy, the wildly popular YouTube lecture series, has launched its free, new iPad app in Apple’s store. The enhanced version of Khan Academy includes time-syncing between devices–no Internet connection required–an interactive transcript of the lectures for easy searching, and a handy scrubber for moving between parts of the lectures. Perhaps more importantly, now that more schools have begun adopting Khan’s lectures for their own classrooms, the iPad app could possibly replace or supplement textbooks, saving cash-strapped schools and students a lot of money. The major benefit of the app is offline learning. “If you’re going on a road trip or if you’re taking mass transit and you don’t have cell service, or whatever, you can get the content,” says Khan Academy Lead Designer Jason Rosoff. The iPad frees Khan Academy from the constraints of a laptop and Internet connection. Rosoff says the app will remember where users left off viewing and sync progress between devices (though, for the initial version, both devices will need to connect to the Internet before going offline to sync). Second, with inspiration from TED, Khan lectures will now have an interactive time-stamped transcript, which is a convenient search function, considering some of the lectures can be quite long. Last, just like a textbook, users flip back and forth between different parts of the content. “People scrub a lot in our videos,” says Rosoff. The app will have an enhanced version video scrubber (the scroll bar at the bottom of a video) that makes repeating areas less painful. For the growing number of schools that are adopting iPads, the most impactful potential for the app is for Khan Academy’s “flipped classroom,” in which lectures are watched at home by students, and then assignments are completed collaboratively in class, where a teacher is present. “The teacher is free to do a lot more of the human interaction,” says Shantanu Sinha, President and COO of Khan Academy. “Very often, students who thought they were horrible in math, who were labeled bad in math by schools … in many cases, they were just struggling with a very specific topic,” Sinha says. “Without the ability to explore lectures at home, struggling students were left behind as teachers progressed through the lesson plan. But, when students could focus on problem areas at their own pace, they could overcome weaknesses and catch back up with the class. The initial version of the iPad app doesn’t include the visualization tools and exercises necessary for a Khan Academy classroom, Rosoff says, but once the tools are part of the app, schools may adopt the Khan lecture series as a electronic textbook replacement. That’ll also give Khan more time to address early feedback about the tools in later app updates. 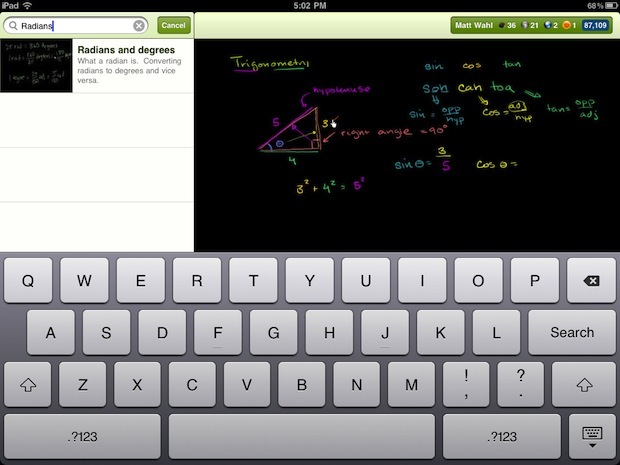 Find the new Khan Academy iPad app here. Follow Greg Ferenstein on Twitter or subscribe to him on Facebook. Also, follow Fast Company on Twitter.